During my swimsuit-making frenzy, I made one more set of swim trunks for Gabriel. That brings my count to seven swimsuits this year! Given the number of little people running around my house, I'd say it's safe to say I'll be sewing as many suits every year. Good thing I enjoy it. 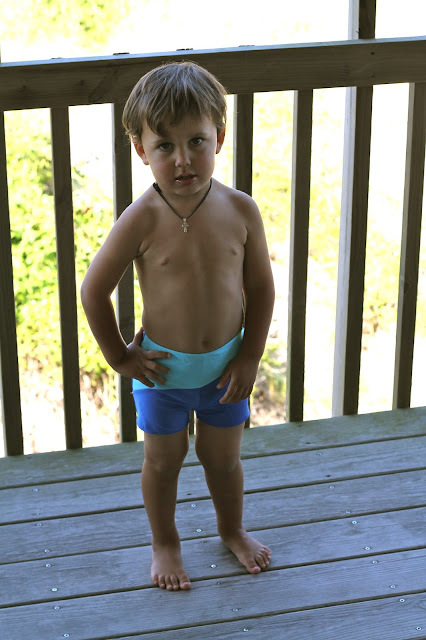 I used the Euro Swim Trunks pattern from Running With Scissors in size 3T. After I'd ordered it I noticed that the Peekaboo Patterns Monaco Swim Trunks pattern is very similar, and has a much wider size range (3mo-12 as opposed to the Euro's 2T-5). It doesn't have the cute curve variation that I used here, but I may buy it next year so that I can make a pair for Niko. The royal blue is a sturdy nylon/lycra, bought during the month that I passed Hancock Fabrics every day on my way to visit my husband in the rehab hospital. The aqua contrast is from the same FabricMart yardage that I used for Z's tankini. The royal blue is very stable for a 4-way stretch, while the aqua is a lot thinner and silkier. I was worried about how they would work together, but they paired just fine. The rash guard is from the thrift store. Next year I would like to try making my own. Others have done it to good effect using the Oliver+S Field Trip, a pattern I already own and love. These were a super-quick sew using my serger. My zigzag hemming has already started to come loose (grrrrr), but I plan to fix that with the coverstitch machine (!!!!!) I got for my birthday. It's still sitting in the box at home and I am not sure when I will have time to play with it. Its mere presence, though, helps me be less frustrated hemming knits. I know I'll be able to redo the hems when they break. The trunks pattern includes a small lining that just covers the front seam and an inch or two in either direction. I sewed it in, but wonder about its utility - I feel like it should be a bit wider. I have never seen a pair of RTW trunks like this, though, so I don't know what they usually look like on the inside. In any case, they are stinking adorable and I plan to make most, if not all, of his swimsuits like these as long as he will let me. Looks great! You are so great at making swimsuits! I am still afraid to tackle swimsuit fabrics... Maybe next year. There's always next year. I can't believe you are afraid - you sew knits SO well! You'd put me to shame. These look amazing! You are so good with swimmers! Also, have a look at the new swimsuit patterns on the Titchy Threads website. There is a girls reversible swimsuit, which I have bought, and also a boys trunks pattern. Very similar to these. Laura's patterns are amazing, I recommend them heartily! I had no idea those patterns existed! Definitely will need to revisit them next year. YOU GOT A COVERSTICH MACHINE?!!! SSOOOOOOO JELLY! Ahem. Sorry, where was I? Oh right, adorable trunks! I have the similar pattern from Titchy Threads I want to do for Joe but didn't get around to it before our beach trip. Maybe this fall since I'm putting him on the waiting list for the fancy shmancy place that apparently is the only real option for teaching your kid to swim, that is, if you dont' appreciate being shamed about your parenting by 16 year olds ... LOL. Love all your swimsuits! I know, I am thoroughly spoiled. I cannot wait to play with it!